This tutorial presents an approach for synthesizing kick drum sounds using Aspect. Aspect is available for Mac OS X, Windows, and Linux in Audio Unit, VST Plugin, and Standalone formats. Download the Aspect evaluation here. The evaluation version is all that is required for following the tutorial. However, only registered users will be able to open the example patch accompanying this article. Download the 808 sample here. Analyzing the source sample will reveal important cues that can help when recreating it as a synth patch. For this, we will use Audacity, a free, open-source, wave editor available for Windows, Mac OS X, and Linux. Audacity can be downloaded from here. Load the original sample into Audacity. The default view in Audacity is the waveform, a graph of time (running along the x-axis) against amplitude (running up the y-axis). The kick sample lasts approximately 0.43 seconds. 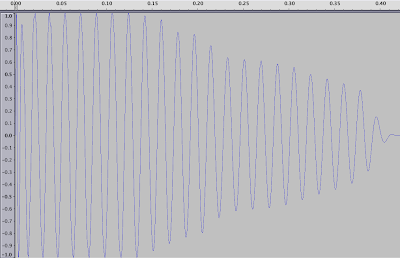 The kick amplitude envelope is more or less stationary until 0.12 seconds, at which point is decays towards 0. The general wave shape is a sine. Zooming in closely to the waveform reveals that it isn't a perfect sine: there appears to be small amount of noise and grit in the signal. The sine is gradually falling in frequency. This can be deduced from the increasing wavelength of the oscillator periods. 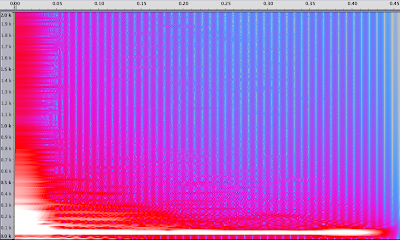 A clearer view of the frequency content of the sample can be displayed by switching Audacity to its Spectrum display mode. Click on the "808kick1" combo box at the top left of the Audacity track, and choose Spectrum from the display modes. Because the kick sample is made of low frequency content, changing the Spectrogram options (under Preferences) to 4096 sample FFT Size and Maximum Frequency of 2000Hz limits the display to the most useful content. An initial burst of noise between 0.00 and 0.05 seconds. A falling tone between 0.05 and 0.20. A steady state frequency of about 50Hz. This gives us enough information to begin synthesis. Open Aspect, and create an empty program by choosing File / New Program. We know the general waveform shape, so change Oscillator 1's Shape to Sine. We don't need the Oscillator to track the keyboard, so remove Note Pitch from Oscillator 1's first modulation slot (by clicking on it and selecting "None" from the menu.) Finally, tune the Oscillator to a suitable frequency: an Octave of -3, Transpose of -7 and Detune of 24cents sounds about right. Playing a note gives a suitably sub-kick like sound. Next, we'll shape the amplitude of the kick using Envelope 1. From our analysis, we know that that sample lasts around 430ms. Tweak Envelope 1 to have an approximate Attack of 1ms, Decay of 430ms, Sustain of 0%, and Release of 430ms. Surprisingly, this sounds much shorter that the source sample. Why? This is due to Aspect having particularly punchy envelopes. Decay and Release stages fall much more rapidly in Aspect than in an 808. Increasing the Envelope Decay and Release times to 880ms gives us the expected sound. The initial noise burst is modeled using Envelope 2 (keeping with its default values of an Attack of 1ms, Decay of 5ms, 0% Sustain and 10ms Release) assigned to Oscillator 1's first modulation slot. A Depth of 39.33 semi-tones lends an appropriate crack to the drum sound. The falling tone is generated using Envelope 3, with an Attack of 1ms, Decay of 55ms, Sustain of 0% and Release of 60ms. This is assigned to Oscillator 1's second modulation slot, and given a Depth of 31.55 semitones. A little grit is added to the drum by introducing a small amount of Noise (about 13%) into the Mixer. In order to add a small pitch variation, the Noise is also used as a the source for Oscillator 1's third modulation source. A Depth of 16.00 semitones sounds about right. Finally, any unwanted high frequencies components are removed by lowering Filter 1's Cutoff frequency to about 62%. Download the Aspect 808 patch here. Whilst it is not exactly identical to our source, it's certainly very close. And in the context of a mix, it'll be even more difficult to tell the synthesized kick from the source sample.